NORTH EASTON, Mass. 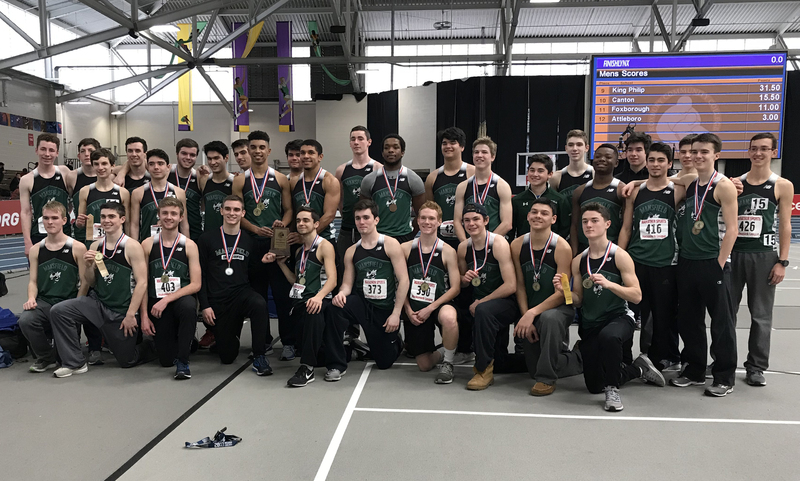 – For the past two seasons, Oliver Ames has been responsible for ending Walpole’s season. The Rebels reversed the roles in 2018. #11 Walpole scored the go-ahead goal in the 79th minute, leading to a 2-1 win over sixth-seeded Oliver Ames. Two seasons ago, the Tigers upset Walpole with a dominate performance. And last year, OA’s James Gillespie scored in double overtime to send the Rebels home. This time around, it was Walpole’s Aidan Murray that pounced on a loose ball in a scrum off a corner kick in the final minutes of the game for the game-winner. 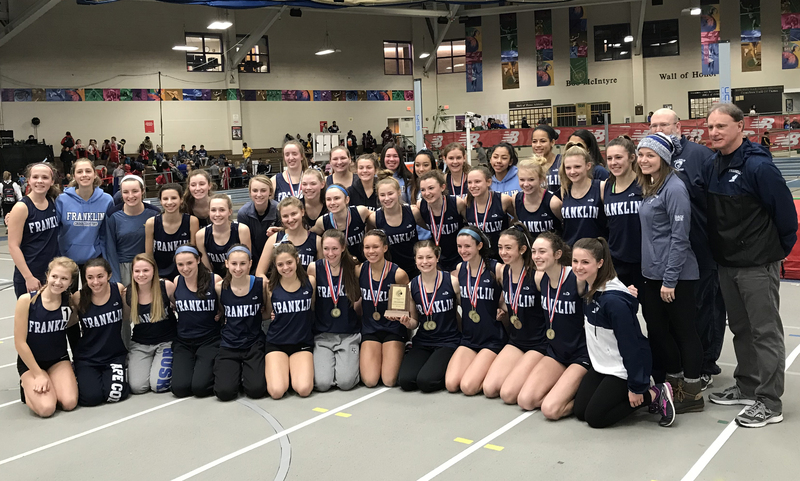 “We have a little history with them, [in the tournament], they got us last year so this was kind of sweet here,” said Walpole head coach Lee Delaney. “I thought the turning point of the game was the save on the PK. The next goal in the game was going to be a big one so that was a huge save. I thought we really took it too them, had a lot of dangerous chances in the box where we just couldn’t find someone’s foot. [OA] is a good club, I know they are young. I knew it would be a toss up game, OA is always a great match but I’m glad we’re on this side this time. The late goal didn’t allow the Tigers much time to orchestrate an attack to try and tie the game. For OA head coach John Barata, the game should have still been tied because of a missed call. “They were horrendous…both hand balls, knocked down and they finished…the refs didn’t call either so it was frustrating for sure,” Barata said. “They came here with a mission to play us off the ball, thump everything forward as direct as possible and go at us. I think the young guys got a little bit of a lesson that they’ll take with them. We have a good amount of kids back so they’ll learn from this. It was a back-and-forth start with both sides venturing into the attack third. OA keeper Jacob Lerman easily handled a Walpole shot from distance early and OA’s Haendel Louhis had a pair of chances go just wide, a shot from the top of the box in the 9th minute, and a header off a throw from Andrew Leite. Oliver Ames broke through in the 27th minute. After senior Sean Flaherty was fouled at the top of the area, sophomore Colin Milliken stepped up and hit a well-struck free kick to give the Tigers the lead. Milliken hit his right footed shot up and over the wall, freezing the keeper on the line for a 1-0 lead. The lead didn’t last long though as Walpole scored just over a minute later to level the game. Walpole sent a corner in and Lerman made a nice stop on the first bid but the rebound fell to Daniel Colbert and he buried it. In the second half, Walpole came out flying and applied a lot of pressure over the first 15 minutes. The best chance fell to the feet of Rebels’ senior Conor McDonough. McDonough took down a ball over the top and had a one-on-one chance against Lerman but the OA keeper came up and was position perfectly to knock the bid aside. Oliver Ames had a golden chance to take the lead midway through the second half but were denied by Walpole keeper Dennis Crowley. 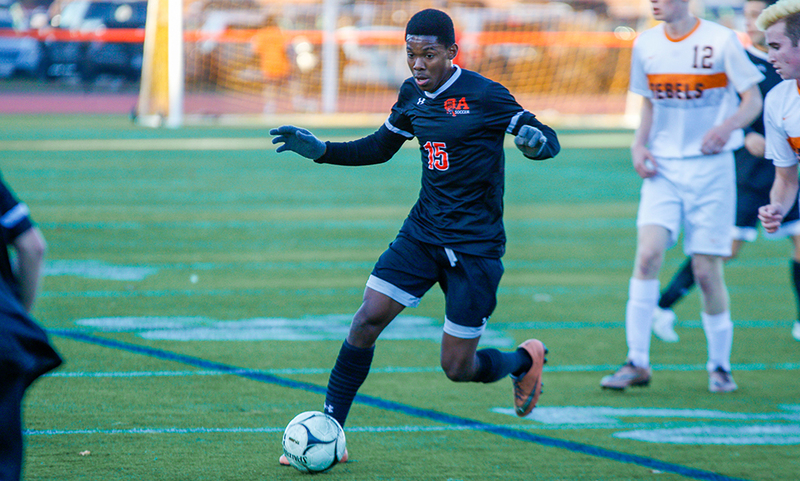 OA sophomore Kevin Louhis used his speed to get past a defender and into the area but was brought down and the Tigers were awarded a penalty kick. Flaherty hit a low shot to the right side but Crowley made a diving save to keep the ball out and keep the game tied 1-1. Oliver Ames boys soccer finishes the season 8-4-5. NORTH EASTON, Mass. – It was all new faces on the field for Oliver Ames, but the result was very familiar. The Tigers, fresh off their third state final appearance in the past four years, have an entire new lineup after graduating two dozen seniors, including all starters and most reserves that played regularly. In the first game with its new line up, Oliver Ames came away with a 3-0 win over visiting Stoughton. The Tigers took the lead in the 15th minute and then broke the game open with back-to-back goals inside the final five minutes of the first half. Oliver Ames established control of the play early and were rewarded by a terrific goal. Sophomore Anthony DaCosta found himself in space when a long ball came in from sophomore Matthew Nikiciuk. DeCosta was given the space to take a touch and turn, and without hesitation the sophomore rifled a nice shot from 25-yards out that beat the keeper and went right under the bar for a 1-0 lead. After a bit of back and forth play for the next 20 minutes, the Tigers changed the complexion of the game in the final five minutes of the first half. Junior Jonathan Freeman came away with a win just over midfield and quickly found the feet of junior Colin Milliken. Milliken turned and played a through ball between two defenders, allowing senior Sean Flaherty to run onto it and slot his shot him at the far post to make it 2-0. Stoughton had its best chance of the half shortly after going down 2-0. Senior Fabi Ponce de Leon played a curling free kick into the area that was spilled but the rebound effort from Gabe Ribeiro was to the left of the frame. OA quickly countered and attacked up the left side. Sophomore Brady deVos found some space in the area and tried to get by his defender but was hauled down. The sophomore stepped up to the spot and calmly blasted his bid into the back of the net just a minute later, giving OA a 3-0 lead just minutes before the halftime whistle. 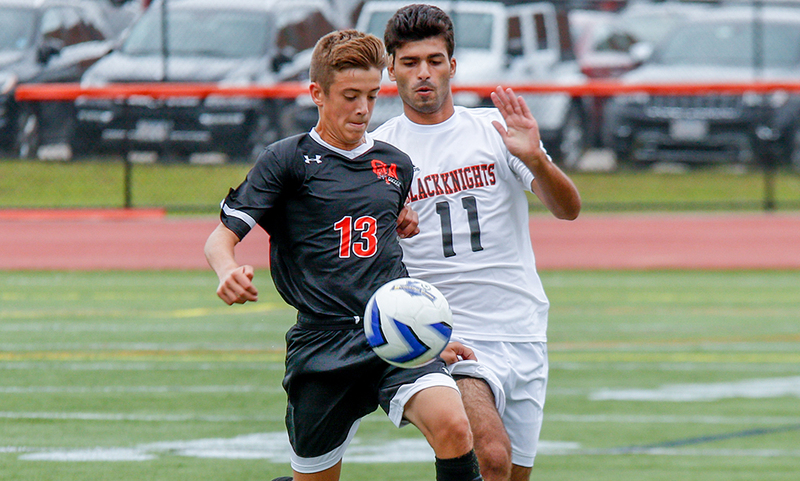 Trailing 3-0 in the second half, the Black Knights tinkered with their lineup in an attempt to get back into the game. While it meant trying to build more offense, it sacrificed some defense. The Tigers were able to take advantage of that at times but couldn’t add onto their lead because of some stellar saves from junior keeper CCarter Gerome (11 saves). Just six minutes into the second half, Milliken once again found Flaherty in behind the defense and the senior used a nice cut back move to free himself but his chance was turned aside by a terrific sliding save attempt from Gerome. Stoughton’s best chance of the second half came in the 61st minute when Ponce de Leon put a free kick on frame but OA senior keeper Jacob Lerman made a move to his right to punch the ball out. A minute later, OA nearly had another goal with Flaherty in alone but once again Gerome came up big to keep the Tigers off the scoresheet in the second half. 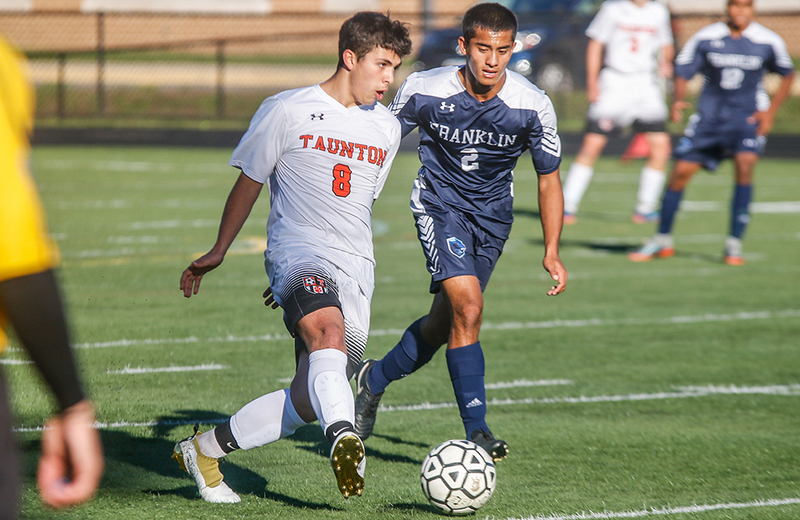 Oliver Ames (1-0 Hockomock, 1-0 overall) is back in action on Tuesday when it welcomes Taunton (0-1-1) to Muscato Stadium. Stoughton (0-1, 0-1) hits the road to take on North Attleboro on the same day.